This cast iron grenade was first used in 1917. It had a stick with 4 cloth straps which functions like a tail. Before use the safetypen had to be withdrawn, and a small shear wire functioned as a second safety. Length 280mm, Weight 737gram including 71gram Bellite, Amatol or Ammonal. 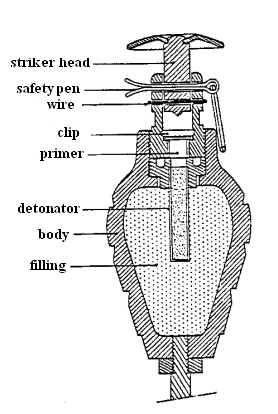 Check Paul's explanation on this grenade, click HERE.